Happy New Year, everyone! I am experiencing a change of scenery this winter and have moved down the road to Cortona. I am dog sitting for a couple of months, taking care of two fun-loving, humongous labradors. After the holidays wind down on the 6th, I will start looking for an apartment over here. The decision to make a move had to do with stepping out of my comfort zone. I have made lots of good friends in this neck of the woods and now that I have a car I have a little more freedom. Okay, maybe being closer to sushi also played a teensy part!! I will have a longer commute to the winery when the season ramps up, but there are always trade offs. I still go to Montepulciano once a week to do English lessons with some of the kids who have been with me since the beginning, and also because I want to make sure I don’t lose touch with Montepulciano, which has the distinction of being my first love in Italy. So my days are filled with dogs, writing, and reveling in the aroma and heat of lovely wood fires every day. The area has more fog than I would like and its enveloping heaviness makes you want to sit around all day contemplating what your next meal will be and the next series you are going to binge watch. I am forcing myself to get out and get my run in and not succumb to the fog’s melancholy pull. I call it depression soup! I am told now that the cold weather has taken hold, the fog will depart. Fingers crossed. Be gone vile beast! So my word for 2017 is courage, or coraggio in Italian. The idea being that I want to keep pushing myself to be more audacious and try new things even when it is scary. And maybe moving 20 minutes down the road doesn’t sound like a big deal, but it was tough to let go of the tether to Montepulciano and all the comfort that comes with familiarity. I have only been in my new neighborhood a month, but I am already loving its vitality. I just did my first Zumba class which was terrifying but in the end fun, and I am joining a book club. The social options over here are varied and I look forward to continuing to explore. So here’s to a bold new year in a brave new world! A portable Christmas…. it always feels like home once the Christmas tree is up! The relief of surviving my first Zumba class with my friend Starr. Sushi for New Year’s… Yes please! ← A Spring in my Step…. My friend you are without a doubt courageous! I’m so excited for you and your next adventure! Can’t wait to check out your new home next time we are in Italy! Happy New Year Jennifer! Looking forward to a new book. We will have to stalk you in Cortona now, so there’s that. Best wishes and good luck in your new home! Happy newyear. Nice you moved to Cortona, that was my first Italian love. Hope to see you this summer at the winery or in Cortona. Felice Anno Nuovo, Jennifer! So happy to hear you are in Cortona, a wonderful town. Maybe you will run into Frances Mayes (“See You in the Piazza!”). Congrats on your new wheels – FREEDOM! Good for you Jenny! New town equals more opportunities, friends, and adventures. Now I will research Cortana to see where you are living. I’m going to read your book again so I’m ready for your next book. What year did you move to Montepulciano? You have had a very interesting life and now the journey continues. Welcome Jen to our neck of the woods. I know what you mean about the fog it can be mind numbing. Looking forward to spending lots of time together having fun in 2017. Good luck house hunting and see you in April. Happy new year Jenny. My book club has chosen your book this month and I just finished it. I’m so excited to read the blogs you have written too. Your writing has kept me interested in how you have been doing since the book ended. We pair our books with a restaurant when we meet to discuss the book. Of course we chose an Italian restaurant! But I’m thinking we need to find one with a great Italian wine selection! Take care of yourself in your new digs! We look forward to your next book! Hi Jennifer, I just finished your book and thoroughly enjoyed all the insight you have gained in understanding the Italian culture. My husband & I have a holiday home in Siena that we travel too several times a year. Once you get beyond the “tourism”, their is a whole different experience to be discovered in Italy. I know the application process for residency, renovating process, and getting to know Italian friends who have an entirely different ethic in traditions, cooking, & working. I love experiencing all of it and reveling in their love of food, family & relaxed pace! Cortona is beautiful-enjoy your adventure there. I will be excited to read your next book! Hi Sharon! Thanks so much for your lovely note. We are fortunate to live and enjoy this part of Tuscany. I am happy you connected with my story. If you have a moment to write a few words on Amazon, it is really appreciated as my publisher is tiny. 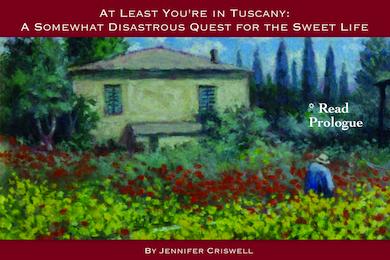 The follow up to At Least You’re in Tuscany is almost done and I hope it will out some time later this year. Thanks again. If you find yourself in Cortona on one of your stays, send me a note and we can go for a coffee!! I just finished your book and loved it. I also have a great love for Italy, traveled to different places in Tuscany, Amalfi Coast and the lake area. It is all so enchanting. I have thought about living in Italy, if only part time but do not speak Italien past a few words. I admire your courage and strength and hope to read your next book.